When two talented, experienced chefs join forces, pitting each other’s strengths and culinary skills together, you can be sure of a meal that will blow your stomach away. 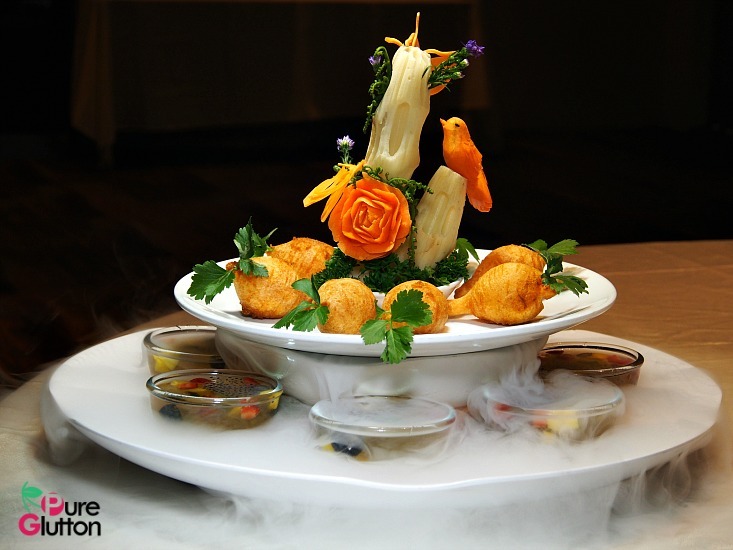 The Oriental Group of Restaurants’ annual gastronomic affair serves the platform for this show-stopping feast to introduce different dimensions of classic Chinese cuisine to diners. 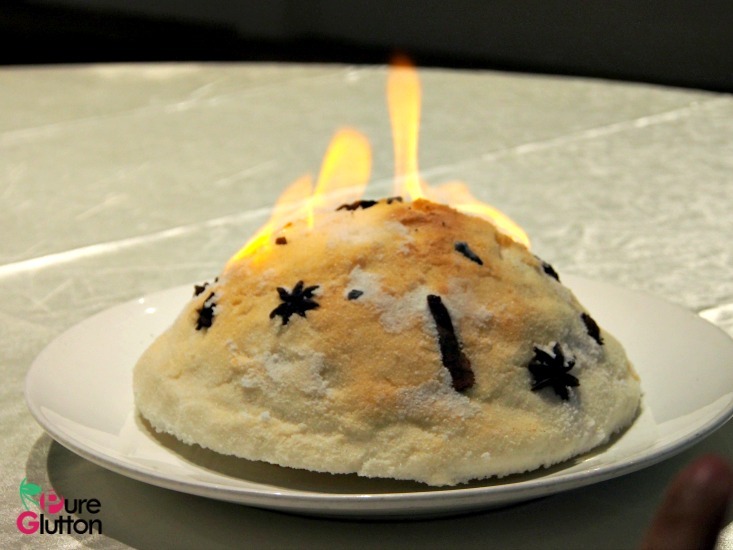 Available from 3-31 August 2018 only, this year’s theme is “China & Nanyang” fusing tradition and innovation in the array of dishes curated by Chef Justin Hor and Chef James Ho. 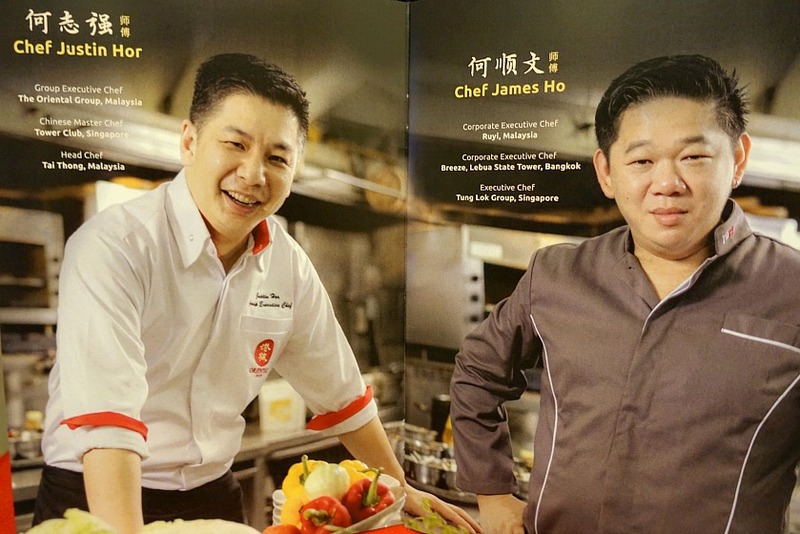 The award-winning Chef Justin Hor needs no introduction – as the Group Executive Chef, he is the familiar face and dynamic force behind the culinary creativity of the Oriental restaurants. Chef James Ho is Corporate Executive Chef of Ruyi, the man behind the iconic miniature nasi lemak sushi (and others) which rocked the KL food scene when Ruyi & Lyn opened in 2015. 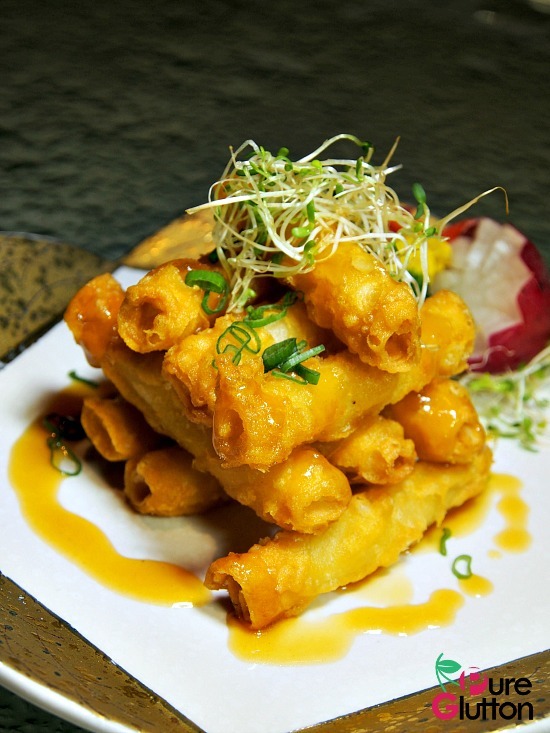 So, with these two culinary maestros putting their years of experience, talent and creativity together, traditional Cantonese dishes with touches of innovative contemporary flair have resulted in a menu that’s both exciting and immensely satisfying. 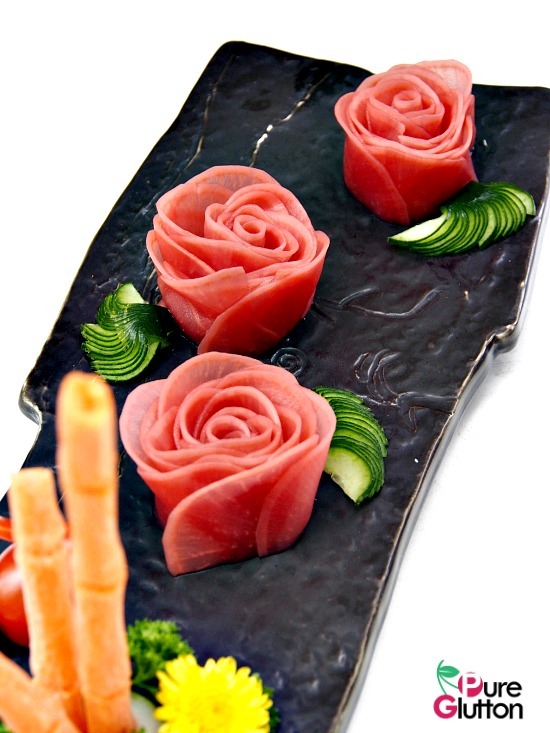 The use of fresh and premium ingredients elevates the meal to the next level of exclusivity and leaves a most luxuriously delicious memory in the mind and tummy. 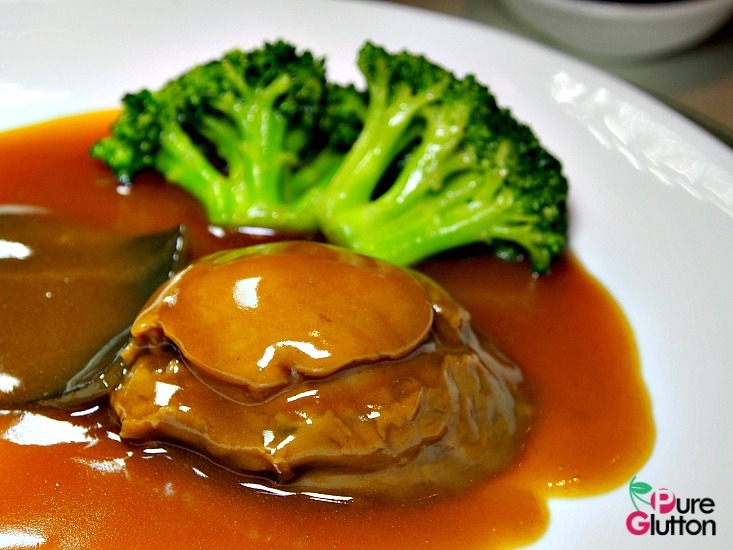 When I say “premium”, think 3-head abalones, suckling pig, foie gras and bird’s nest – all used liberally in the scrumptious dishes in this special menu! 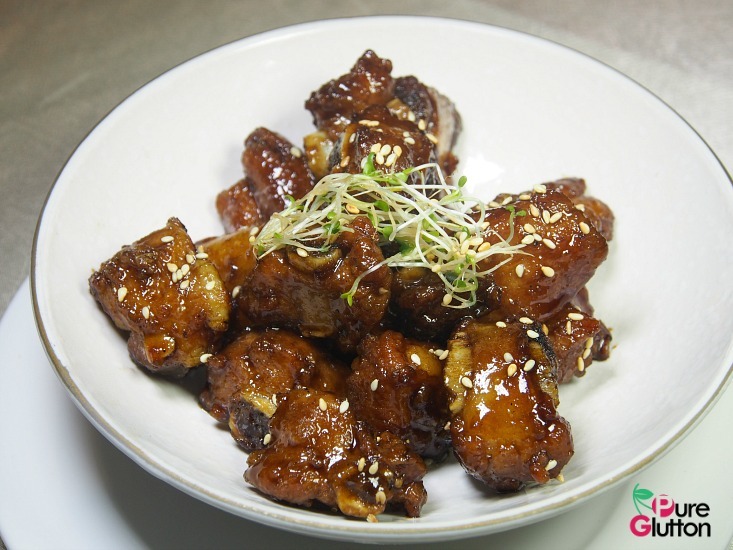 Priced at RM2,388 nett for a table of 10 people, it works out to only RM238.80 per person and for the amazing dishes served, that’s really excellent value-for-money. 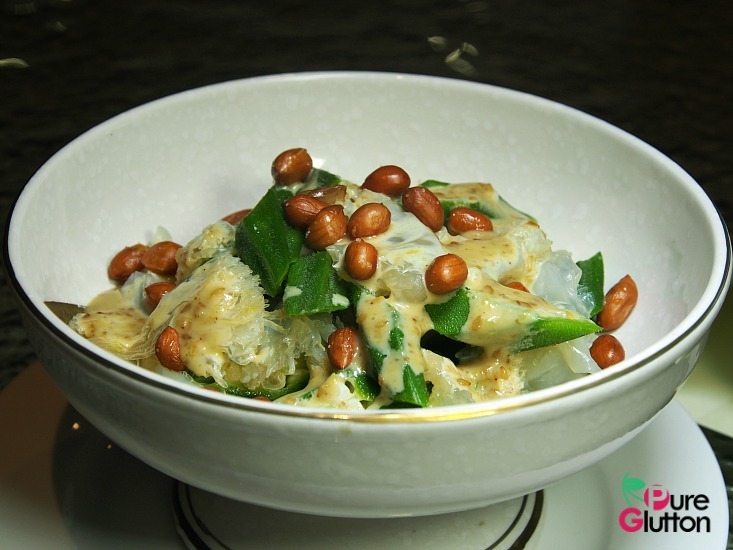 The “Nanyang” factor for this theme refers to the flavours of South East Asia. 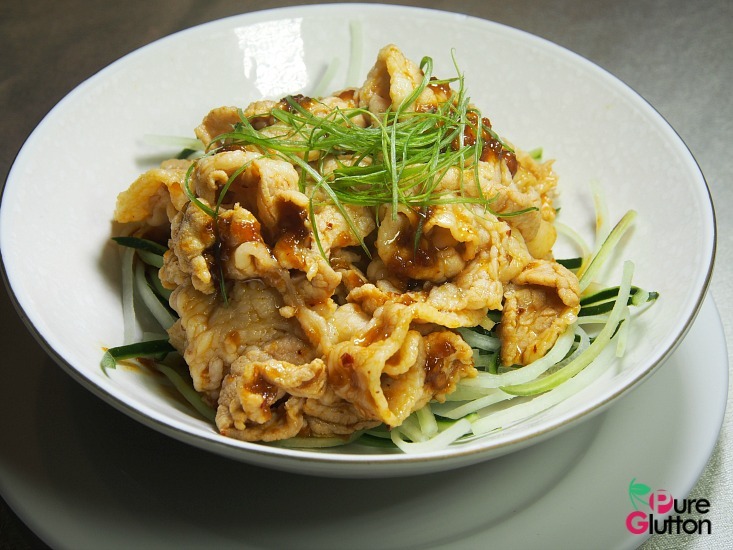 Centuries ago, when the Chinese explored and migrated to South East Asia, it’s inevitable that Asian influence would creep into Chinese cuisine evolving it into what’s known as “Nanyang” dishes. 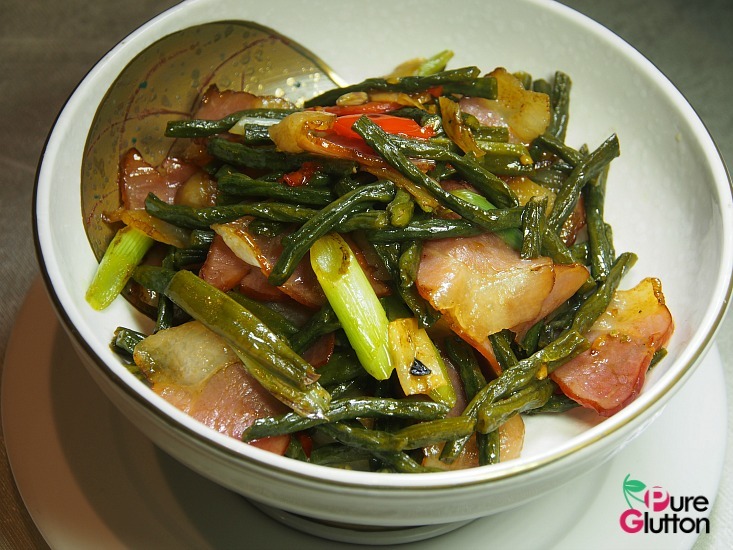 Hence, you will taste dishes which are a bit more intense in flavor, thanks to the usage of Asian herbs, spices and sauces. 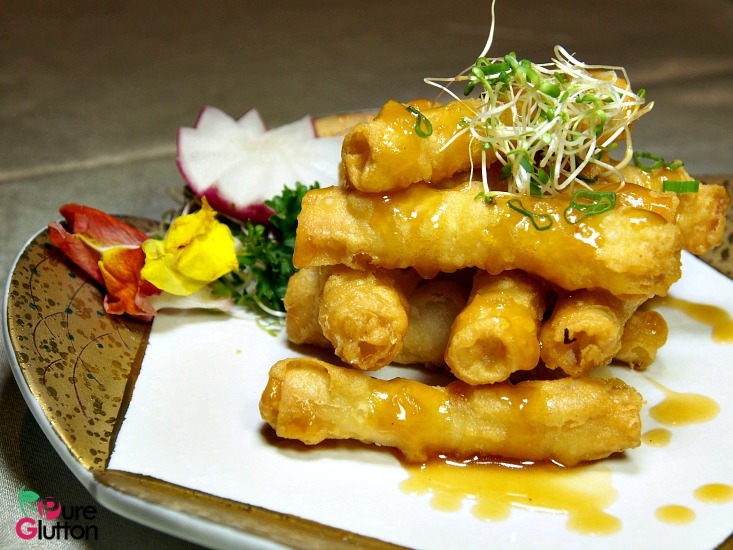 The meal starts with a Tapas Platter of 6 items and the Nanyang influence is pretty evident in these delightful bites. 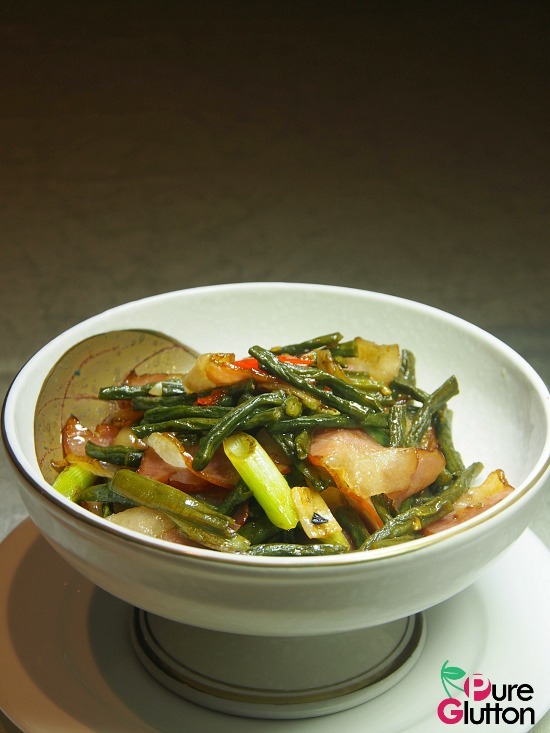 Stronger tastes emerge from the spicy garlic sauce poured over the tenderest of pork belly slices, radish stained a lovely pinkish hue by sour plums, okra paired with jellyfish and smoky Hunan meat saute’ed with dried long beans – these are the very appealing appetizers in store! 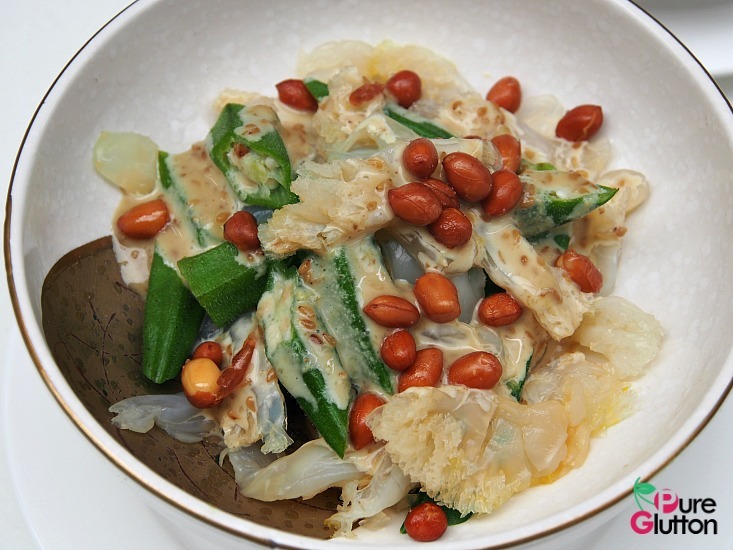 The 5 main dishes are of course the stars of the show. 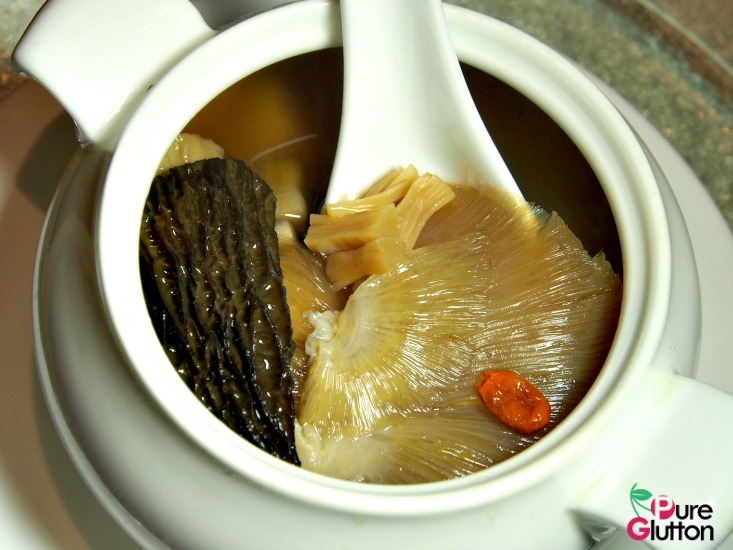 The Superior Double-boiled Soup sets the pace and it is a soup that’s prepared with great care over a long period of time. 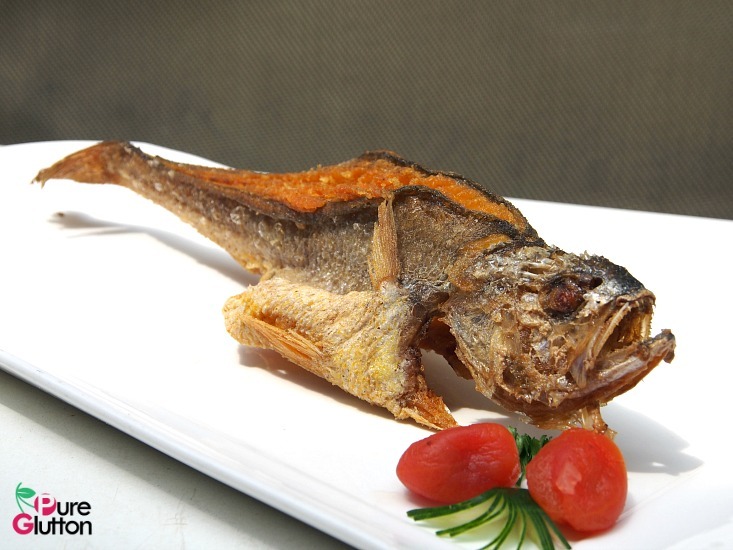 The cleaning and preparation of premium dried seafood is a meticulous affair, not to mention the more than 10 hours of boiling needed for the superior stock. 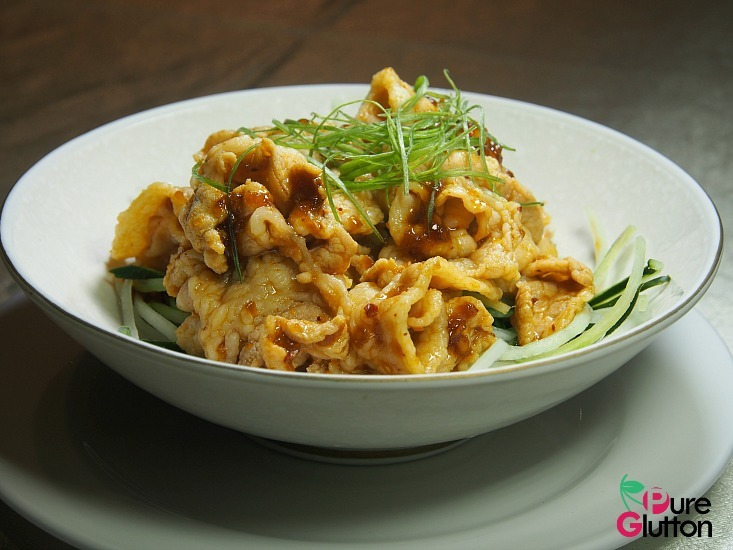 The menu is flexible to offer either sharksfin or fish maw in the soup, so do state your preference when booking your orders. 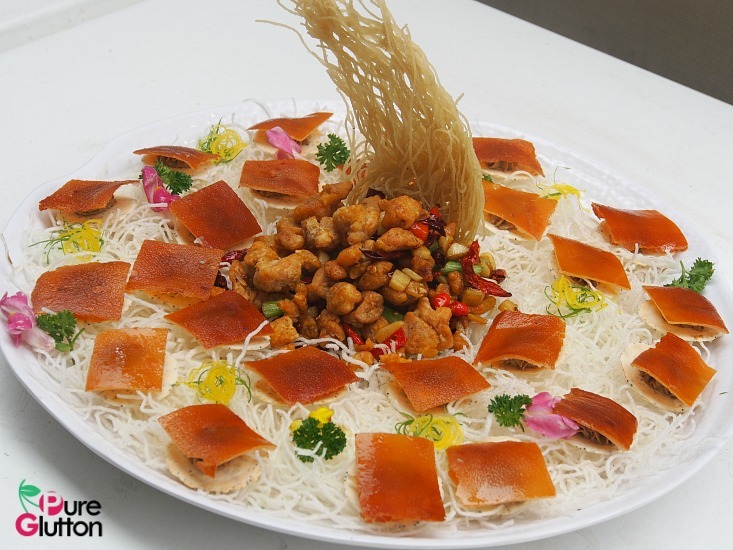 The roast suckling pig dish is a joint-effort from both chefs. The modern twitch here is the smooth foie gras mousse used to sandwich the crispy piggy skin with a crunchy cracker, doubling the joy when you chew on this. 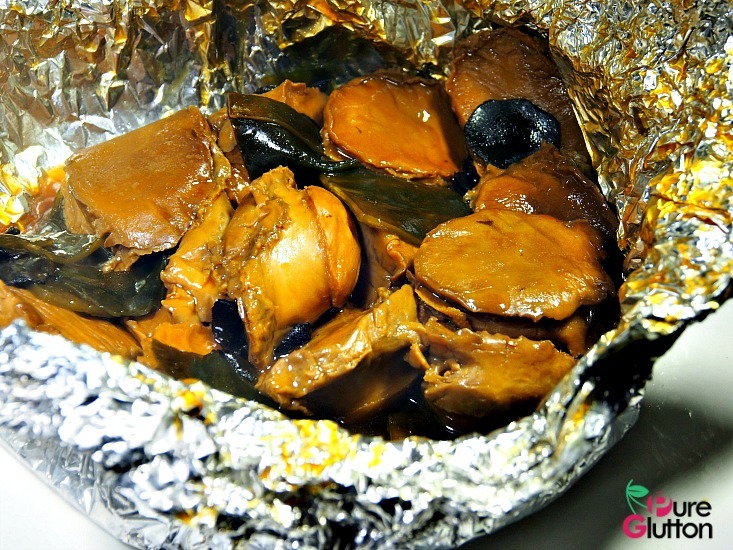 Ahhh… what can I say about the abalones? Braised for 10 hours in Japanese kelp (konbu) and perfumed with truffle, the abalones are baked inside a salt mound studded with star anise and cinnamon. The heady fragrance from these spices adds a delicate aroma to the abalones, causing me to eat my portion at the slowest pace just so that I can savour the experience to the max! Need I say that this is my favourite dish? Before this meal, I’ve never heard of “yellow corvina”. Such a pretty name for a plain-looking fish. But don’t let looks deceive you because this is one of the tastiest fried fish I’ve ever had. 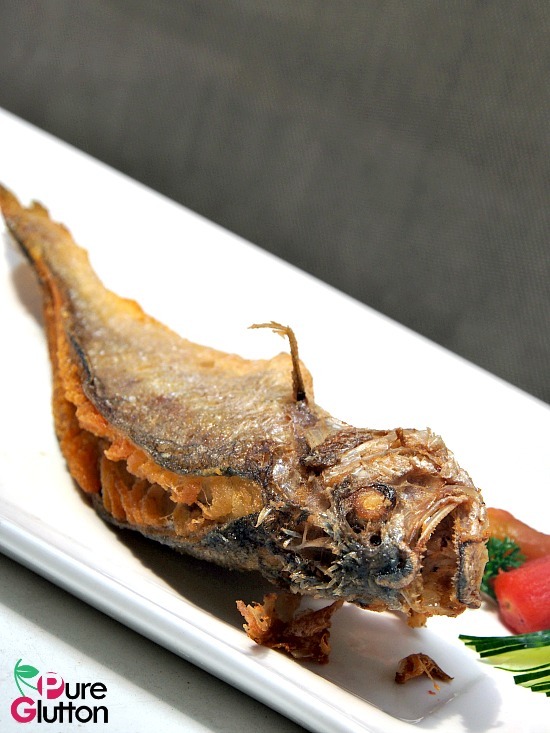 Oh I managed to glean the secret from Chef Justin on how to perfectly deep-fry a fish, too! The Chinese must have their carbs and so to fill up the tummy, there’s Chef Justin Hor’s signature crispy rice served in cute little pumpkins. 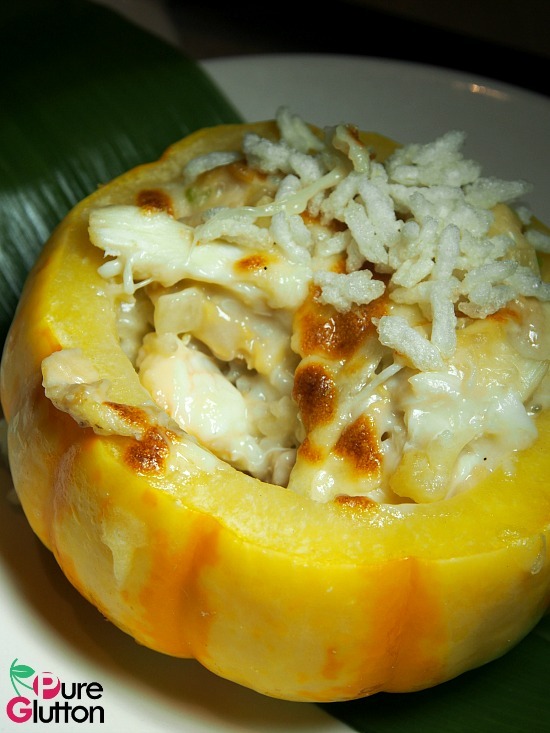 Beneath the cheese and rice, there are seafood treasures – I’ll leave it to you to find out what those are! Do save some space for desserts. Both the chefs have their hands in these. 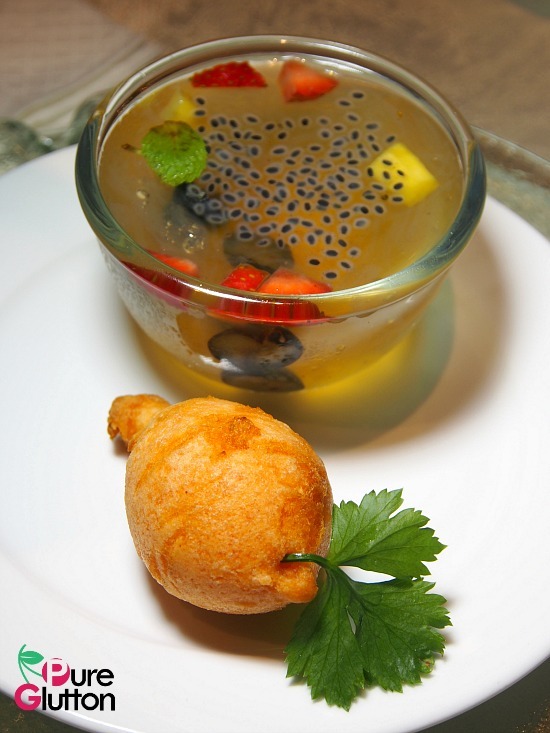 I totally love the cold refreshing bird’s nest with white fungus, fresh fruits and mint leaves. The accompanying dumpling (shaped like a plump carrot) oozes this amazing filling of buttery peanut lava which is so good I wished there’s more than one dumpling! 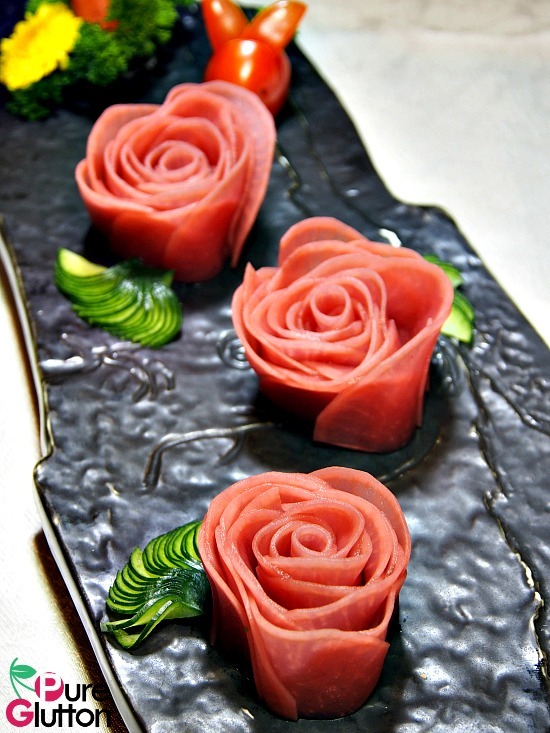 I hope they’ll have this in their regular dim sum menu soon so that I can have plates of them! Seriously, this is the best Chinese meal I’ve had this year so far. 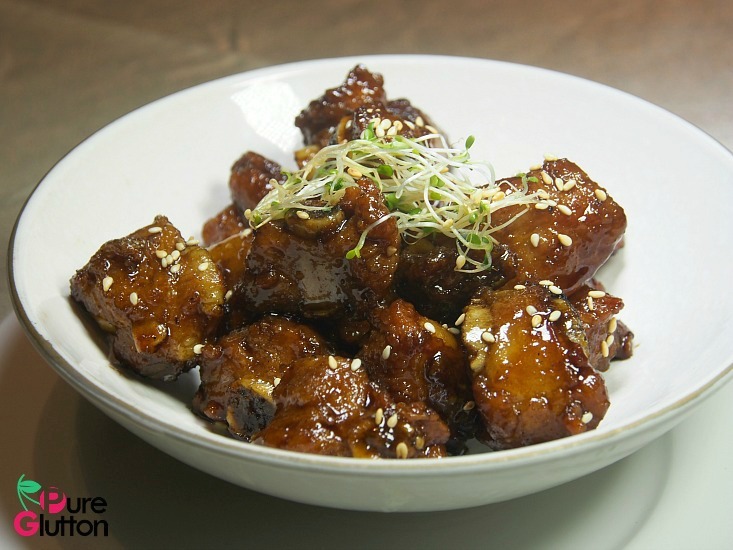 If there is ONE Chinese meal you must eat in a restaurant, this is it. I’m planning to round up some makan kakis to go for this again. If you plan to do so as well, do call now and book ahead because reservations are piling up already as most food connoisseurs in town (who are fans of Oriental restaurants) have been waiting for this feast. And like I’ve said before, at RM2,388 nett per table for 10, it’s a steal. 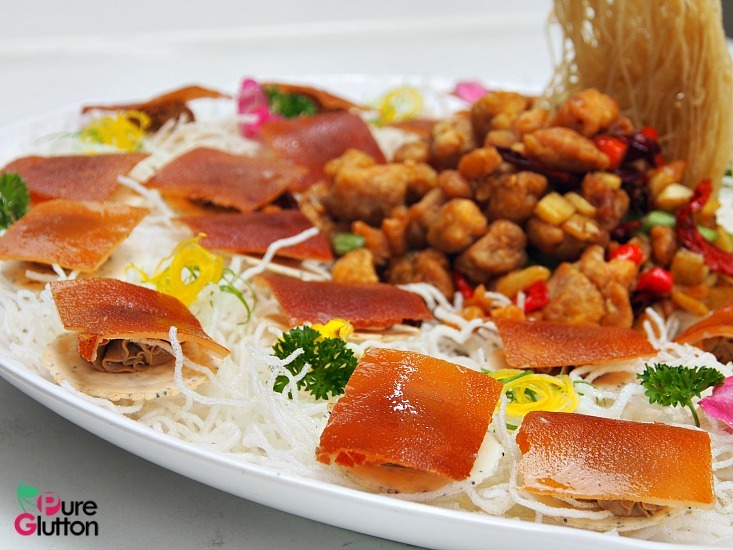 Please note that at their PORK-FREE Maju Palace Restaurant, Oriental Seafood Restaurant and Ruyi Restaurant & Lounge, the roast suckling pig is replaced with Peking Duck. In the tapas items, pork is replaced with chicken and duck. Besides calling the restaurants directly for your reservations, enquiries and bookings for this special set menu can also be directed to Emily (012-392-2082) and Melysa (012-599-6028).